Well, I guess for everyone home in Minnesota, winter is already here! Sorry about that. I have been craving one last weekend spent outdoors before it gets too cold to leave the warmth of my apartment. After hearing about one such trip ? a weekend of adventure caving, zip-lining, sky jumping, and bare-handed fishing ? Ben and I were sold. 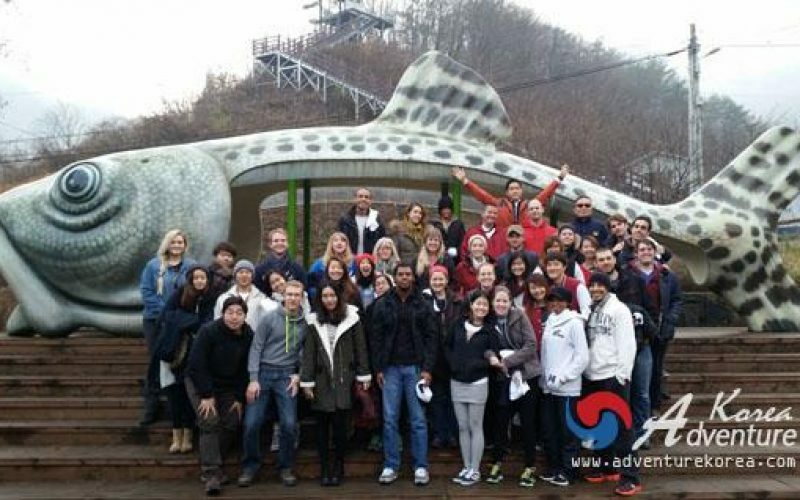 The trip was led by Adventure Korea, a company that organizes trips around the country on a budget. Many of the excursions include activities, festivals and experiences you wouldn’t easily be able to plan on your own. Two of our friends signed up as well and we eagerly awaited the excursion, unsure of what exactly to expect. Our weekend started Friday night at one in the morning when we boarded a night train bound for Seoul. We got a few hours of shut-eye before arriving just after 4 a.m. and hung out in McDonald”s (since it was the only heated area in the train station). After a couple long, cold hours of waiting for the time to pass, we finally met up with the rest of our group. After everyone piled into the bus we began the three hour journey east of Seoul to Gangwon province. Mountains rose above us in all directions and the bus windows fogged up from the combination of biting cold air outside and body heat from within. A scarf over the eyes is the best way to sleep! We arrived at a small village where we would be spending the weekend just before lunchtime. With a population of just 50 people, our group of forty nearly doubled the size of the town. Fun Fact: The village we stayed at was in Pyeongchang county. This may sound familiar, as it is the location for the 2018 Winter Olympics! After a delicious lunch, we changed into red jumpsuits and rubber boots, and strapped helmets on our heads. We were then ushered into a small boat that brought us to the cave entrance. The next hour and a half was incredible. We walked, crawled, and shimmied through crevices and wide, gaping spaces in this other-worldly place. We made our way past stalagmites and limestone formations. Our guide pointed out rocks that resembled an elephant, the Virgin Mary, and even, well… male genetalia. He also showed us tiny, almost microscopic “cave shrimp”, as well as cave flowers, crystals and sleeping bats. Photo courtesy of Adventure Korea. It was all pretty remarkable, but my favorite part was near the end of the tour. We reached a large, open area and took a seat. It seemed almost as if we were in an auditorium and we were sitting on the stage. Our guide instructed everyone to turn off their headlamps so we could experience complete darkness. I”ve experienced darkness, I thought to myself as the lights flicked off one by one. But this was an entirely different kind of darkness than that which nighttime brings. There were no shadows or silhouettes. You could not make out any shapes. There was no difference when your eyes were open from when they were closed. I waved my hand in front of my face and saw nothing. We sat there in silence for five minutes, but I could have stayed longer. It was unlike anything I have ever experienced. It was a good thing they gave us jumpsuits, because all the crawling on the cave floors left us pretty dirty! While half of the group went zip-lining, we explored the aquarium in the town. After a 3D video, we walked past tanks of freshwater fish and turtles. The most interesting part of the aquarium was a tank full of “doctor fish” – yes, these little guys are famous in Southeast Asia for nibbling the dead skin cells off the feet of backpackers and locals alike. There were small openings in the tank though which you could stick your fingers. The sensation of their tiny suction cup mouths snacking away on my cuticles was pretty bizarre, yet surprisingly addicting. Hailing from Minnesota, “the land of 10,000 lakes”, I”ve caught my fair share of fish. But never have I tried fishing with my bare hands! Our guide led us down to a small canal filled with fish. When I heard we were fishing, I was imagining a stream. This scenario, however, definitely seemed like an easier option. The canal was stocked with forty trout ? just about one for each person in the group. It certainly seemed that the odds were in our favor. After shedding our shoes and socks, and rolling up our sleeves, we waited on the edge of the water for the signal to hop in. Our guide counted us down from three, and on cue, we all jumped into the icy water. Yes, it was that cold! After a minute of flailing around, my feet and hands went numb ? allowing me to ignore the cold and focus on catching a fish. The problem was that every time I grabbed onto one of their squishy, slimy bodies, they slipped out of my grip ? partly because they are quick, but mostly because I became scared of hurting them and didn’t hold tightly enough. I guess my luck is better with a line and hook, but I had so much fun that I’m determined to try again someday. The sight of forty grown adults screaming and splashing around in icy cold water was absolutely worth the freezing limbs. Lucky for us, some people were actually pretty skilled at catching fish with their hands. We had a feast later that night! On some organized trips, attention is paid to the activities, but the food consists of meager helpings of mystery meat and soggy vegetables. This was not the case with Adventure Korea. We ate well all weekend, but the clear winner of the meals was dinner Saturday night. We enjoyed a seemingly never-ending meal of sam gyeop sal – grilled pork belly. As with most Korean meals, we ate this family-style with lots of side dishes. By the end, we were stuffed. We collectively decided that it was one of the best meals we have had so far in Korea. The activities didn”t stop after dinner. We bundled up and packed into two electric buses. We were each given a set of headphones and we could listen as the guide told us where to look for the best chance of seeing wildlife. We each got a go looking though infrared and night-vision binoculars. Though it was rather quiet, we did eventually spot two wild boars taking a drink from the stream. We returned to a giant bonfire and forty aluminum foil packages roasting atop the grates alongside sweet potatoes. That”s right – while we were away, our fish from earlier in the day was prepared and grilled for us! I was still quite full from dinner, but the trout looked so delicious I grabbed a pair of chopsticks and joined in with the rest of the group in devouring our catch. Man oh man, it was good! One group member passed around a bag of marshmallows he had purchased on the US Army base in Seoul. Yes, I was beyond full at this point, but marshmallows are a rarity in Korea and I couldn”t pass up this little taste of home. I skewered mine on a chopstick and roasted it until golden, gooey perfection. Our home for the weekend was a beautiful pension (guesthouse) with a full kitchen and more than enough space for the seven of us staying there. We turned on the ondol (floor heating) right away, and enjoyed the warmth all night long. We were all given matching shirts by Adventure Korea! After breakfast on the second morning, we set off on a hike into the nearby mountains. Fog hung low, but as we neared the lookout point, sunlight started to peek from behind the clouds. We reached a clearing in the thick trees from which we could overlook the winding river in the valley below. Selfayyyy time! Photo courtesy of Adventure Korea. After adequate time for everyone in the group to take selfies, we hiked back down the mountain, our legs calf-deep in crunchy leaves. Sunshine + zip-lining. A pretty good combination, if you ask me! We ended the weekend with zip-lining. Ben and I both zip-lined once before in Costa Rica, and compared, this one was much smaller. That being said, I don”t think I could ever go zip-lining and not enjoy it. Once we reached the platform by zip-line, we jumped the 50 feet (15 meters) to the ground. Don”t worry though, the “sky jump” apparatus created tension so the jump was a soft one. This trip is called “Adventure Caving and Zip Lining” and is offered in October and November. The cost of the trip is 85,000 won ? an incredible deal for transportation, activities, accomodation and 4 meals. 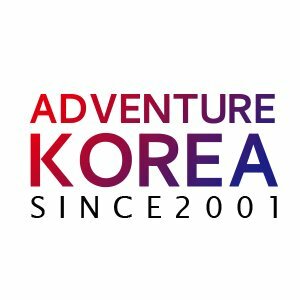 For more information on this trip and other adventures, visit Adventure Korea”s website.